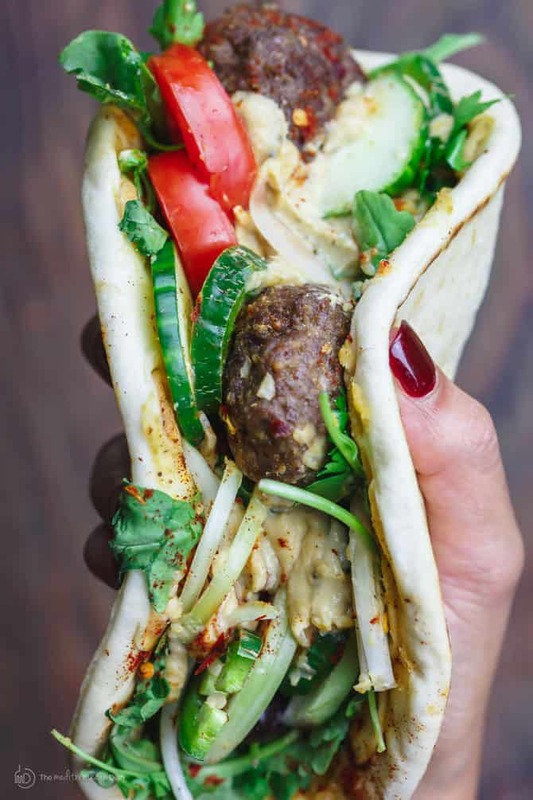 In this easy baked kofta pita sandwich we have, flavor-packed ground lamb (or beef, if you prefer) patties, loaded on top of Greek pita with hummus spread, fresh veggies, and olives. A great weeknight option, or a make-your-own-sandwich bar for your next party! Step-by-step tutorial included. 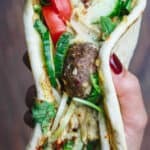 The idea for this baked kofta pita sandwich came together last-minute on a day when my routine was a bit out of sorts. Without much of a plan for dinner, I decided it needed to be sandwich night. Where the draw lies in this pita sandwich dinner is in its simplicity–everything is piled on top of a warm Greek pita. Easy, but far from plain. 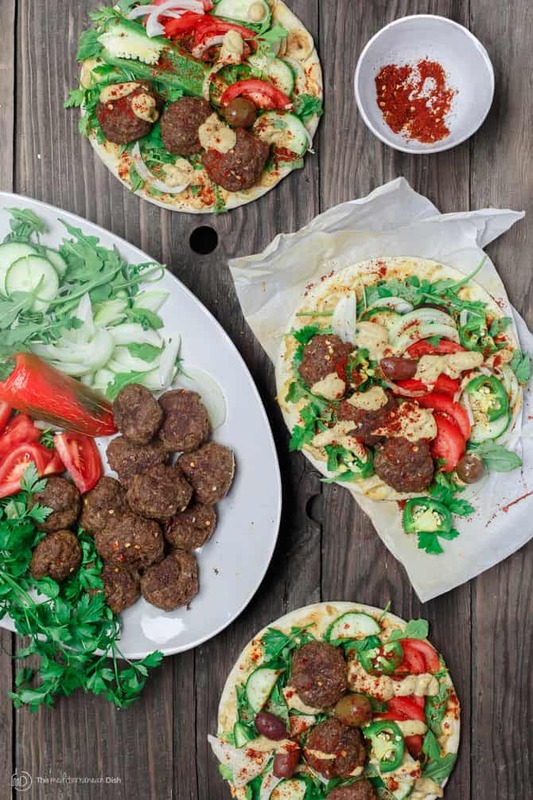 The baked kofta here takes inspiration from Adana, a large city in southern Turkey. My first introduction to Adana kofta was at a small Turkish restaurant here in Atlanta, and I have gone back at least a dozen times since! So, I finally decided to try my hand at a homemade version. In Adana, what gives the kofta it’s distinct flavor is a warm, persuasive spice combo of lemony ground sumac, and smoked Turkish chilies (which I sorta forged here by using red pepper flakes and smoked paprika). The spices are added in the actual lamb mixture, and also sprinkled on top later. When it came to proper serving, I took the easy way out by having everyone fix their very own pita sandwich. Parsley and arugula; sliced fresh vegetables; and olives, all went on a large platter. Obviously hummus is my choice of sandwich spread here. I reached for two options from Sabra’s new line of spreads: Sabra sea salt & cracked pepper hummus spread, and the garlic herb hummus spread. The perfect addition to this sandwich! If you haven’t seen them yet, you can find Sabra’s new refrigerated spreads in the deli section of your supermarket. They are absolutely delicious; and they come packaged in squeezable bottles, which makes them so convenient to use on all sorts of sandwiches! 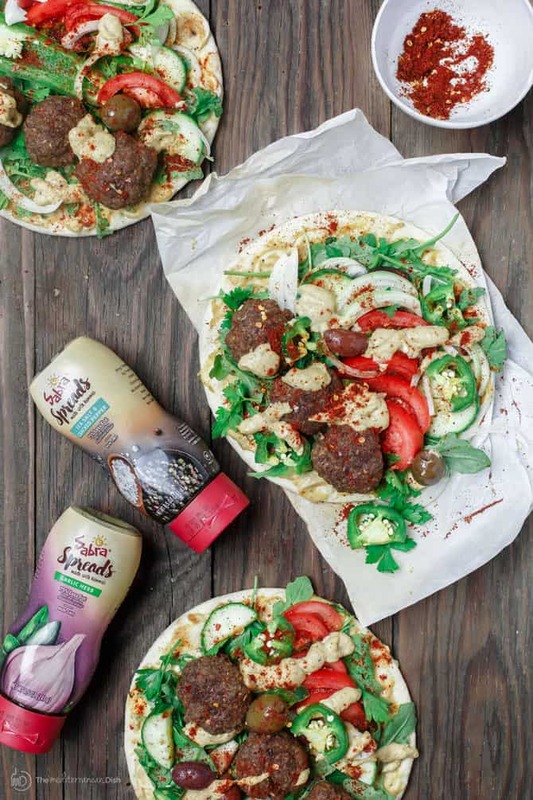 I really like wholesome Sabra spreads made with hummus as a healthier alternative to mayo. They are 75% less fat than mayo, and they use fresh ingredients and flavors. Needless to say, our unplanned make-your-own-pita-sandwich dinner was a hit! I will be repeating it for a large party soon. In a large mixing bowl, combine the lamb, egg, bread crumbs, and garlic with the salt and the spices. With clean hands, kneed together until all is well-combined. Now form the lamb mixture into small balls. 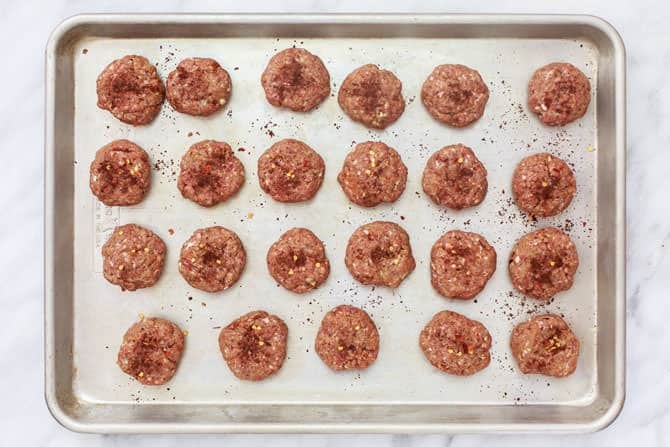 Push lightly to flatten the meatballs into patties and arrange them about 1 inch apart on a large baking sheet. Do not crowd the kofta patties, use two baking sheets if necessary. Bake in the 425 degrees F heated oven for 20-25 minutes or so (make sure the kofta patties are well-browned and the center is fully done). While the kofta is baking, mix together a small equal amount of the spices (sumac, red pepper flakes, and smoked paprika). Set aside for now. Prepare the Greek pita bread, Sabra hummus spreads, and the rest of the fixings. When the kofta patties are fully baked, remove from the oven and sprinkle the spice mixture on top. 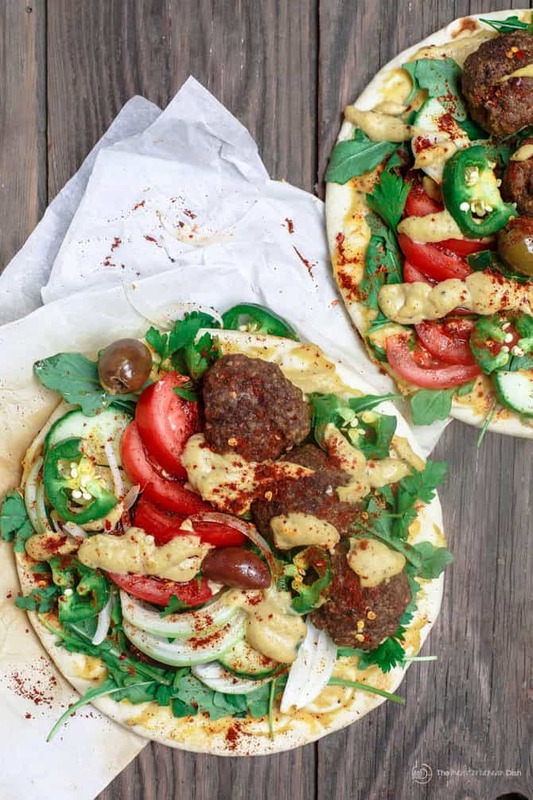 If you like, you can arrange the baked kofta patties, vegetables and olives on a large platter to allow everyone to make their own pita sandwich. To make the pita sandwiches, spread a generous amount of the sea salt & cracked pepper Sabra hummus spread (or the garlic herb Sabra hummus spread) on the Greek pita, then top with the baby arugula and parsley. From here, add as many baked kofta patties as you like (usually 3-4 per pita is a good amount), and your choice of fixings (I like to load up on the fresh veggies and olives; oh, and a little spicy jalapenos). Finish off with another squeeze of that delicious Sabra hummus spread! 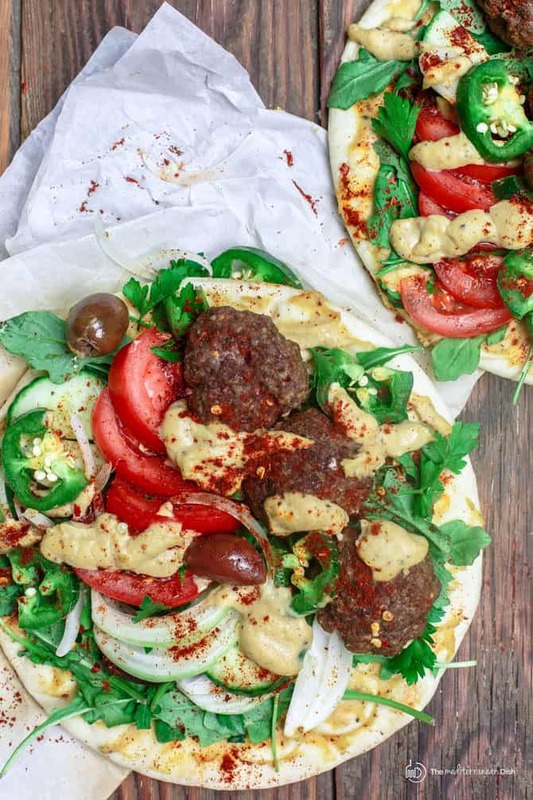 These baked kofta pitas can be served open-faced or folded into wraps. Now wrap your face around this beauty and ENJOY! In a large mixing bowl, combine the lamb, egg, bread crumbs, and garlic with the salt and the spices. With clean hands, kneed together until all is well-combined. Form the lamb mixture into small balls. 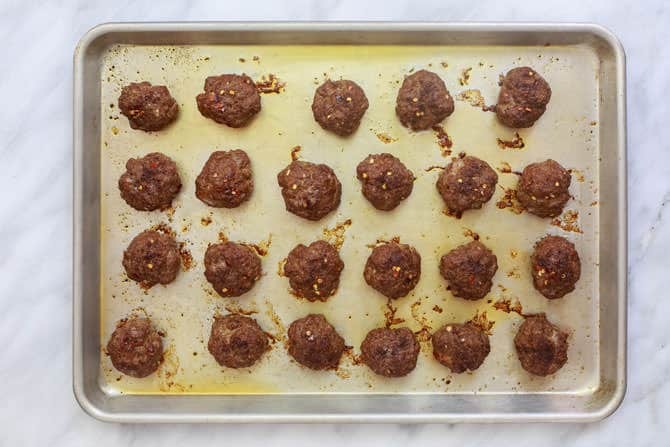 Push lightly to flatten the meatballs into patties and arrange them about 1 inch apart on a large baking sheet. Do not crowd the kofta patties, use two baking sheets if necessary. Bake in the 425 degrees F heated oven for 20-25 minutes or until the kofta patties are well-browned and the center is fully done. 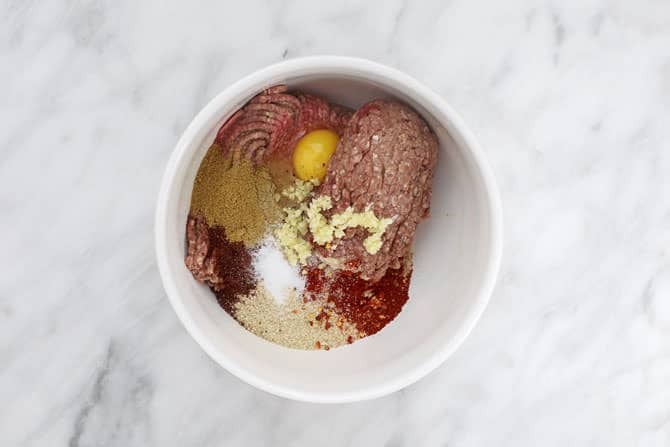 While the kofta is baking, mix together a small equal amount of the spices (sumac, red pepper flakes, and smoked paprika). Set aside for now. Prepare the Greek pita bread, Sabra hummus spreads, and the rest of the fixings. You can set everything up for a make-your-own-sandwich bar, if you like. From here, add as many baked kofta patties as you like (usually 3-4 per pita is a good amount), and your choice of fixings; tomatoes, cucumbers, onions, olives, and jalapeno peppers. Finish off with another squeeze of the Sabra hummus spread! Serve the baked kofta pita sandwiches in folded wraps or open-faced. Enjoy! 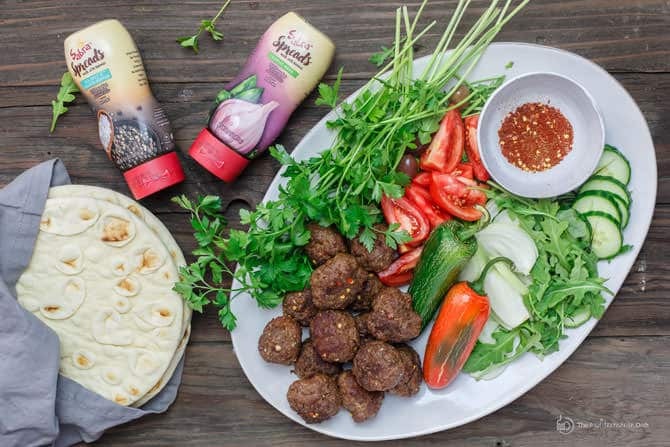 By the way, the new Sabra spreads are vegan, kosher, gluten-free, and non-dairy. They contain 0g Trans Fat, 0mg Cholesterol and are made with quality ingredients. Learn more here. *This is a sponsored post on behalf of Sabra. All opinions are my own, and I share them here for your benefit. You referenced a favorite Atlanta Turkish cafe- could I ask you to share its location? Thanks for sharing. I discovered this recipe a month or so ago and we have had these three times now….I did it exactly the way the recipe said the first time, and it was fabulous. The next two times I added a bit of Aleppo pepper and chipotle chili powder…..we love the extra heat it adds. Wonderful, Annette! thank you so much for sharing! I so enjoy Mediterranean food, but lamb is super expensive here in southern Alberta, even though many farmers raise sheep/lambs! Would it be a completely unkosher to use a combination of beef and turkey, for example? Hey Suzy…..I’ve just mixed up the lamb and am setting aside for a bit while the flavours to develop and I can have a bit of a clean down. I put my face in the bowl and took a deep breath…..it was like an explosion of gorgeousness all over my senses! Can’t wait to get this cooked up and on my plate! ? Hi Suzy, I love your website. I am a pretty experienced cook myself. Just made this and it was a big hit. I substituted ground sirloin for the lamb and, as Sabra spreads were not available, I just used Sabra hummus. Thank you so much, Barbara! What a kind note. So glad you enjoyed this simple recipe too! Hi Suzy, I am returning with updates, didn’t freeze the Kostas,made them the night before and baked them the NexT morning. Everybody loved the sandwiches. Three thumbs up???. Might change up the spreads! Awesome, Diana! Have a great weekend! Hi Suzy, it’s me again, can not find sabra spreads, what can I substitute it with? Thank you. Hi Diana. Yes, I think you can do this ahead. A couple of options. 1) Make the kofta patties and bake them, and then let them sit to cool. Arrange them nicely in a freezer-safe container with a tight lid and freeze. All you have to do is reheat in a 350 degrees heated oven. Or 2) Make the kofta dough, form into patties. Do not bake. Arrange in a single layer on a large tray lined with parchment paper. Freeze for two hours or until they harden, then move them to a container and freeze until ready to use. I would follow the cooking instructions from there. My hunch is that option 1 is easier. I will get to your other question shortly! Thank you Suzy for answering my questions, I will do that, already bought every thing I need, I found two of the Sabra’s spreads horraii?????. I will come with updates on Thursday , my girls friends are from Azerbaijan, so keep my finger crossed. We SEE if i will ne albe to wow them??? Great! Hope you love it all!!! Such a tasty looking sandwich. I did not know Sabra made spreads. The Sabra spreads are brand-new! So good! And convenient! This is an awesome recipe! I’m assuming that those are red onions and kalamata olives. also, i wonder if there is a place for preserved lemons in this recipe — it seems like a good fit. Hi Hollis, thanks for stopping in. Yes, kalamata olives and red onions would be great on this sandwich. I used a variety of olives I had on hand, and in the absence of red onions, yellow or sweet onions are great! And sure, the preserved lemons would be great! This looks amazing! I want to take a bite right now. I love kofta. This looks like an amazing recipe. Thanks for sharing! I didn’t know Sabra made spreads in a squeezee bottle!!! That’s so much more convenient! Gorgeous pictures btw! I know! I have all three Sabra spreads in my fridge all the time now. So convenient for sandwiches, and tasty. Thanks, Tina! I love Mediterranean recipes but this one will be on my table this weekend. Very nice. I think that you just inspired me to make these over the weekend. I love ground lamb and this recipe! Love this idea! And your pictures make me wish I was eating this for lunch right now! I’m going to have to stock up on my spices for this recipe. Awesome, Brianna! You’ll find it so easy…and the spices and the new hummus spreads are available in supermarkets. If you can’t find sumac, you can grab it here online. I have placed many of your recipes in my ” favorites eats” file. I have forwarded your blog to quite a few of my fellow foodies. 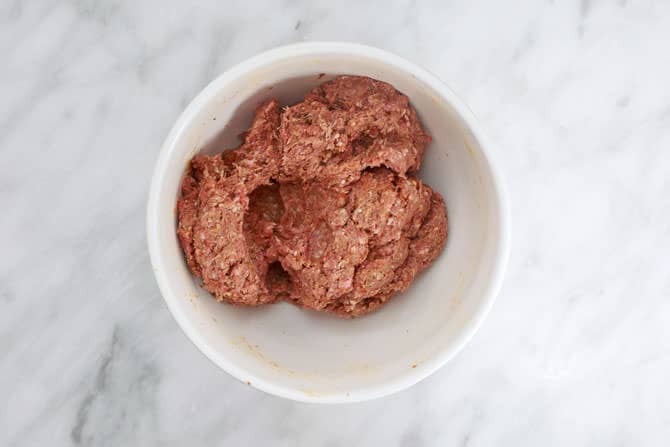 For this yummy Kofta recipe: I will use local butcher, versus supermarket, to do super trimming of lamb before grinding. Will try using one pound 97% fat free ground turkey mixed with the well one pound trimmed ground lamb. Egg product does just as well as a yolk to bind patties. A request for a ” instant spice mixture( s).” I would like to prepare several “cultural” spice mixtures, for quick flavoring of dishes. Egyptian, Morrocan, Greek, Italian, etc. could you share a recipe for “typical” proportions of the various national tastes? I really do love your blog! Thank you, Catherine! I am so grateful that you enjoy the blog, it means a lot to hear that. And thank you for sharing it with friends. Lamb is generally lower in fat that beef, and if you do have access to a local butcher, you can get quality lamb and even have them trim any fat for ya before grinding. I used to do that back in Iowa. I will keep your request for the spice mixtures in mind. There is already a homemade shawarma spice mixture here that works great both on chicken and meat. But I will think more on the rest…There is something in the works about spices that I can’t share right now 😉 Stay tuned. Hope you enjoy this recipe! What is the red spice you sprinkle on the finished product? Ok, read it again. It is the mix you made up. Hi Nadia! Correct, the spice mix I added at the end is the sumac, red pepper flakes, and smoked paprika. You can see the ingredient list in the recipe box at the bottom of the tutorial. Enjoy!